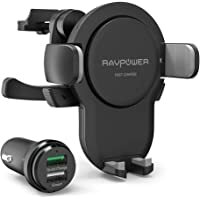 Get RAVPower Wireless Car Charger with iPhone Xs Max XR X 8 7 Plus Galaxy S9 S8 Note 9 8 and More for only $17.99. Tip: Avoid low or no feedback sellers, search and select "Buy It Now" tab and sort by lowest price. You may modify min price to filter accessories to get RAVPower Wireless auctions.